Assam Chief Minister Sarbananda Sonowal on Monday sought the help from law students in disseminating correct information about the Citizenship (Amendment) Bill (CAB), 2016. Assam Chief Minister on Monday asked a group of students from the Bishnu Ram Medhi Government Law College to educate themselves with the knowledge about the right connotations of the Bill so that they can spread the correct message in the society as future lawyers. He said that the state government was working resolutely for the holistic development of the young generation of the state and urged all sections of the society not to create any distraction for the students by spreading false information regarding Citizenship (Amendment) Bill 2019. 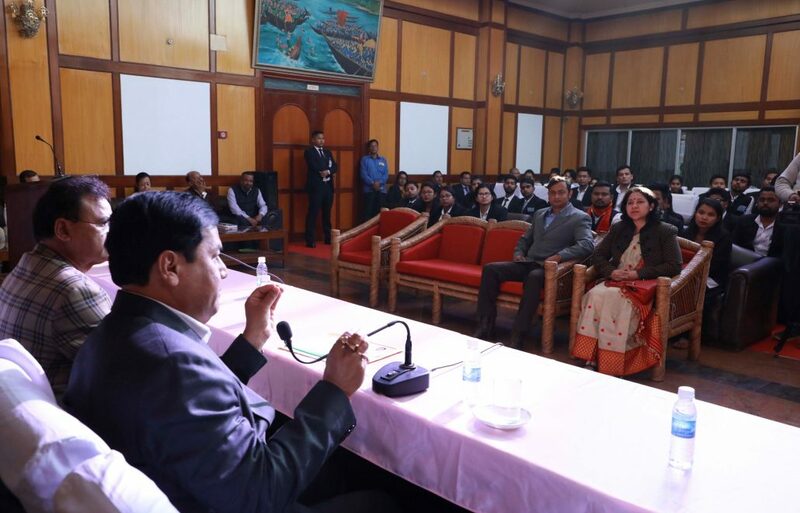 The Chief Minister’s interaction with the students was part of an exposure tour of the Assam Legislative Assembly on Monday to let them witness the Assembly session and thereafter, they participated in an interactive programme with the Chief Minister at the central hall. Saying that there is no shortcut to success and the students must work hard to achieve success in life, Sonowal called upon the youth of the state to stay alert and not to get swayed by misinformation campaign being run by vested interest groups about the Bill and assured them that 1.9 crore foreigners are not going to come to Assam once the Bill gets passed as projected by certain quarters to destabilise the state. He also urged the youth of the state to take advantage of the recently opened Start Up Assam – The Nest, the incubation centre for budding entrepreneurs, to work on their innovative ideas to develop enterprise and bring industrial revolution in the state.